We currently have eight 225L French oak and two 225L Hungarian oak barrels. The inside of each barrel was shaved down and custom toasted for us in St. Catharines, Ontario. We only select our most popular reds, and our most popular white wines to age in the barrels. 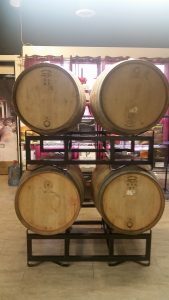 The wines will be fermented and cleared in individual batches, and then racked together into the barrels where they will age anywhere from 8-12 months. Please contact us for details if you would like to participate in this program. **Please note: We follow allow legal requirements detailed in our ferment on premise license. Individuals must visit our store to begin the fermentation process. We are offering both full and half batches. A full batch will produce 28 bottles, and a half batch will produce 14 bottles. ** Markham Economist and Sun Reader’s Choice Winner for 2014 and 2015 and nominated for 2016 (results TBD). Congratulations, Markham Heritage Wines is nominated for Best Brew Your Own Wine/Beer in Markham by the readers of the Markham Economist & Sun in our annual Readers' Choice Awards 2016.